Beat the egg and water in a small bowl to make the egg wash. Keep this aside for now. Unroll your pastry sheets and cut them into small rectangle strips. 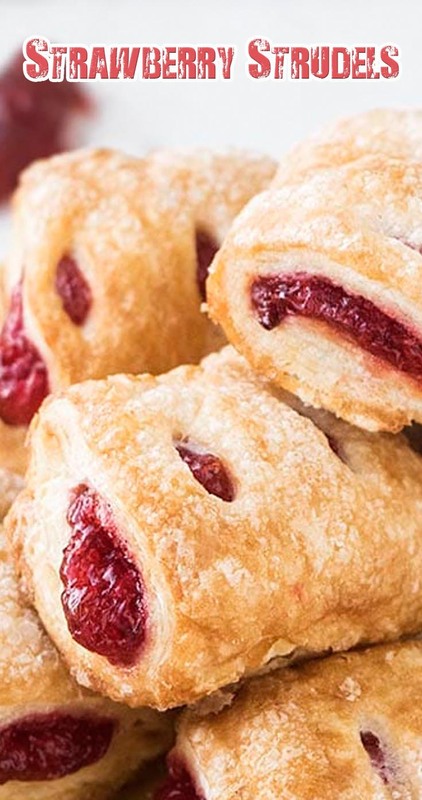 Place 1 tbsp of strawberry preserve in the center of the pastry strip. Fold one side of the strip on top of the preserve. Brush a little egg wash on top on the strip and then fold the other side of the strip. Press gently so that both the ends stick together. Then, flip this strudel onto a cookie tray lined with parchment paper. Use a knife to make two cuts on top of the strudels so that steam can easily escape. Brush some egg wash on top of the strudels and sprinkle sanding sugar. Bake at 400 degrees for about 20 minutes or until the strudels are puffy and their tops and edges are golden brown. And you are done making easy strawberry strudels.